Yes, time to read the writing on the wall -- that is, if you can make it out. Thanks to e-mails and word processing, penmanship is a dying art. But there may be some value to reviving it. CBS News Correspondent Tracy Smith reports. Kwasi is not only "a man of letters." The little boy from Mother Jones Elementary school in Maryland is pretty attached to the ones in the alphabet that spell his name. But the biggest thrill is when he writes those letters in cursive. "I feel grown-up," he says, "because most of the grown-ups get to write in cursive." Teaching kids to make those loopy letters is still a priority for Mother Jones Elementary. Another boy, named Dante, says he likes how neat his writing looks in cursive. And though little Connie does not admit it, her writing is pretty good, too. Principal Sheryl Logan notes, "By the end of third grade, they can type 10 words per minute. However, I feel strongly that kids still need to learn how to write cursive." But the principal might be fighting a losing battle. Asked what percentage of students today would she say have poor handwriting, Logan replies, "Unfortunately, a little less than 50 percent." Charles Trafford, who runs a handwriting instruction company, says, "The computer age really ushered in what I call 'the age of apathy' in handwriting, because everybody figured the computer would eventually take over the entire task of written communication." As a result, he says, there are no longer written requirements about whether to include cursive in curriculums, so many schools have severely shortened lessons, or worse, "the teacher just says: I don't have time to teach handwriting anymore," he says. After elementary school, kids get little practice, and the art is lost. He notes, "For several years, we conducted the National Handwriting Contest, and it focused on cursive handwriting specifically. But we had thousands of teachers that would send in handwriting samples that were awful, just terrible." So after 25 years, Trafford canceled the handwriting contest. In this high school, thanks to computers, cursive has gone the way of the 8-track tape and the rotary phone. Even teachers want homework to be tech-savvy. About the teachers, Janie, a student, says, "They say, 'No, you can't write it. You have to do it by computer.' You can e-mail it to them, put it on a disk, but it has to be typed, most of the time." Needless to say, students' cursive leaves much to be desired. Carrie Wells says, "I haven't actually written in cursive in years, but when I do it's just terrible." Dymond Rudy says, "Cursive sometimes is too sloppy for you to understand it." And Arantes Stephen says, "I think writing's going to be outdated after a while. Everything, to be efficient, everything's going to go electronically." 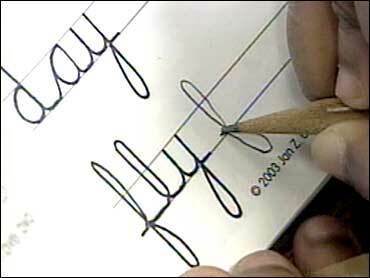 Think about it: how often do you use cursive in your daily life? Smith only uses it to sign her name and that's not even legible. But research shows the very act of learning cursive is vital to developing other skills. Brain scientists are discovering that there is a direct link between movement patterns that kids learn when they write and the ability to read fluently. You'll also be a better speller because if you learn that muscle pattern your brain is going to remember it automatically. But perhaps the most obvious benefit of this fancy form of penmanship is the points it scores on etiquette. Trafford says, "And, finally, everybody appreciates a nice handwritten note." So educators at Mother Jones Elementary School continue to fight to keep pencils moving. And kids like Kwasi can dream of a day when cursive makes a comeback. He says he is going to use cursive when he gets older to "to write a book." One of the problems with teaching cursive today is that it tends to get squeezed out by other curriculum priorities, like preparing for standardized tests. But at Mother Jones, the daily cursive lesson is only 10 minutes, so usually they can fit it in.